None of the parties aims at strategic transformations. 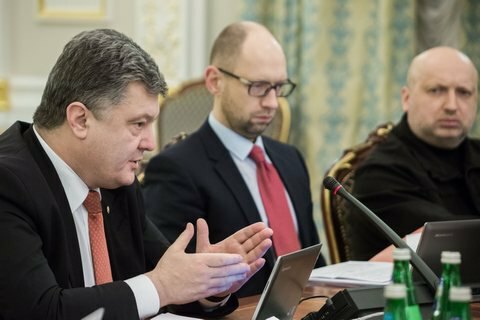 The current situation bordering on the parliamentary-government crisis was provoked by Prime Minister Arseniy Yatsenyuk's statement on the necessity of holding a referendum on constitutional amendments, which constituted an attempt on Petro Poroshenko's subjectness on the international arena, Gorshenin Institute's experts have suggested. They predicted no real political crisis was going to happen in Ukraine because "none of the subjects aims at strategic changes in the layout of Ukrainian politics (while those who do, such as Yuliya Tymoshenko or the Opposition, have no capacity for this)," Gorshenin Institute Vadym Omelchenko and expert Dmytro Antonyuk said in their article entitled "Crisis in heads" and published on LB.ua. They suggested that the initiative to hold a referendum was aimed not at introducing changes to the constitution but was yet another way to defer this issue indefinitely or even remove it from the agenda. That is because "there is no demand in society for a change of the constitution". In their words, the president is not interested in either changing the constitution or implementing the Minsk agreements because as a result he would lose his subjectness on the international arena. The presidential administration's reaction and a threat of government dismissal is just a way of "regulating the length of the government leash and making Yatsenyuk come to senses after his referendum ideas". "Let us suggest that there will be no government dismissal or parliamentary election this year. It may seem that the president is tempted to push Yatsenyuk and [Interior Minister Arsen] Avakov out of politics by means of a re-election to the legislative body (by all accounts, the electoral rating of the People's Front is hardly different from zero), however there is no certainty that the president's own political force can stand the test of a new election and at least repeat the previous results. And the need to build a capable coalition after a parliament reshuffle is the pain no-one wants to think about," they said. Agrarian minister: "It would be irresponsible to leave now"